We admit it: We're suckers for iOS accessories that take us back to a time before iPhones and iPads, when you had to hook up an expensive console to a television set in order to play games like Pac-Man. Luckily, this week's roundup includes just such an item, as well as a few other new products that caught our eye. Bruda Cases: The BrudaBlock 2 (iPad and iPad 2; $30) is a stand that can be used to prop up your iPad in either landscape or portrait orientation; with an iPad 2, it can even be used as a typing platform thanks to the clever arrangement of its positioning grooves. This clever contraption is also made entirely of cherry hardwood, which is both beautiful and environmentally friendly. Kivic: There are plenty of Bluetooth-enabled products that allow you to wirelessly play music from your iPhone or iPad on your car's stereo. The makers of the new Kivic One promise their product is an improvement over those systems, offering higher-quality sound reproduction using Apple's AirPlay technology. Kivic isn't saying what the price of the system will be, but the One will be launched sometime in the first half of 2012. Satechi: Your car's cup holders can do more than just hold cups. They can also anchor Satechi's new $30 SCH-121 Cup Holder Mount. The mount is designed to keep your iPhone or iPad in a driver's view—and reach—while allowing largely hands-free operation; it pivots and tilts so the user can get the best view of their iOS device. Scosche: Speaker systems are no longer just being built to accommodate the iPad—some make Apple's tablet the centerpiece. So it is with Scosche's BassDock docking system (iPad and iPad 2; $150), which includes two 40-mm speakers and and a 3-inch subwoofer, all while powering up your iPad with 10W of charging power. The iPad can be displayed in portrait or landscape orientation; the BassDock also lets you tilt the tablet at a variety of angles for optimal viewing. Ten One Design: The Magnus (iPad 2; $50) is a handcrafted stand that holds up an iPad 2 using the magnets on its side. This makes the stand nearly invisible from the front while still providing excellent grip and stability for viewing your iPad. To top things off, the stand is made entirely of recycled or recyclable material to help keep waste to a minimum. ThinkGeek: Miss your Nintendo from 1988? The $25 iCade 8-Bitty remote control will remedy that situation as you wirelessly play old-school video games on your iPad. The controller is designed for use with the Atari's Greatest Hits app, though it is compatible with other game offerings. The accessory requires two AAA batteries and comes with eight buttons and a D-Pad to direct the action. 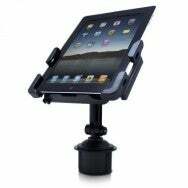 Vogel's: The Flex Mount (iPad and iPad 2; £65) fits into the company's RingO attachment system to provide a quick and easy way to hang your iPad or iPad 2 on the wall. It uses an extensible bracket that is convenient and discreet. USBFever: More and more developers are creating ways to use the iPhone and iPad as a dashboard for scientific instrumentation. So it is with the $50 iCelsius Pro, a probe that plugs into your iOS device and takes temperature readings. (You'll want to use it in conjunction with Aginova's free iCelsius app.) The probe can measure temperatures from -22 degrees F to 302 degrees F—and yes, it will give you those readings in either Farenheit or Celsius measurements. USBFever says the iCelsius Pro is ideal for judging the right temperature of a baby bath, optimal tea brewing, cooking, and other uses.